This article shows an example of calculating a date and a period between dates according to the business calendar. You can read about scripts for working with the business calendar in this article. The business calendar defines the weekends and holidays and the working hours. To learn more, read this Help section. In contracts and other documents, the terms are usually specified in business days, for example, " ...within 14 business days after payment." To automatically control these terms, use calculation according to the business calendar. You can also use the business calendar to automatically determine the task execution time. You cannot simply take away the start date from the end date, because in this case the days off, lunch break and non-working hours are not taken into account. 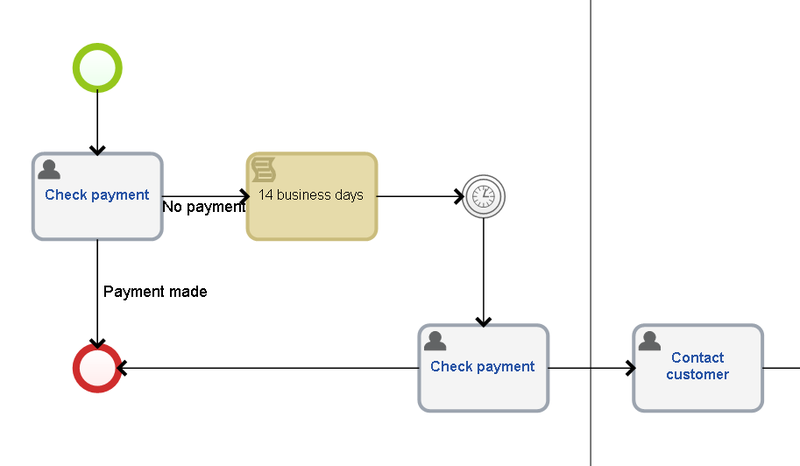 The system waits for 14 days for the customer to make the payment. Consider the Emergency Call process, where the operator receives a phone call, registers it and hands the order to a technical support specialist. The specialist receives the order in form of a task and starts working. Once the task is complete, the employee closes the task and ELMA automatically calculates the time spent on the task, and registers it in the system. The script below is relevant for ELMA from 3.8 to 3.12.1 inclusive. To invoke the Request Execution task, the following script is used. It is executed when the task is created in the process and adds the task to the Task context variable. To learn more about such scripts, read this article. When working with exception dates in the EvalTargetTime function we do not recommend using TimeSpan. 24 hours is 1 day, but as long as business hours are concerned, usually 24 hours mean 3 days. That is why it is best to use a function that adds business hours and minutes (pass TimeSpan, but not long).